From Marvel, the studio that brought you the global blockbuster franchises of Iron Man, Thor, Captain America and The Avengers, comes a new team—the Guardians of the Galaxy. 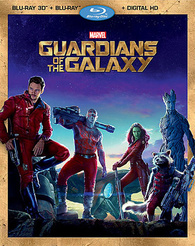 An action-packed, epic space adventure, Marvel's Guardians of the Galaxy expands the Marvel Cinematic Universe into the cosmos, where brash adventurer Peter Quill finds himself the object of an unrelenting bounty hunt after stealing a mysterious orb coveted by Ronan, a powerful villain with ambitions that threaten the entire universe. To evade the ever-persistent Ronan, Quill is forced into an uneasy truce with a quartet of disparate misfits—Rocket, a gun-toting raccoon, Groot, a tree-like humanoid, the deadly and enigmatic Gamora and the revenge-driven Drax the Destroyer. But when Quill discovers the true power of the orb and the menace it poses to the cosmos, he must do his best to rally his ragtag rivals for a last desperate stand—with the galaxy's fate in the balance. While I generally enjoy Marvel’s movies, I’m not what you’d call a full Marvel fanboy. I went into ‘Guardians of the Galaxy’ knowing absolutely nothing about this part of the Marvel Universe, save for the character Thanos, who’s the badass looking mothertrucker in the post-credits scene at the end of ‘The Avengers‘. Much like last year’s 'Iron Man 3' and this spring’s 'Captain America: The Winter Soldier', Marvel really seems eager to explore new genres and the theme of what defines a superhero. ‘Guardians’ is a great time at the movies – fun, action-packed, and seemingly effortless. For the first time since the original 'Iron Man', you don’t need to have seen all the other franchise entries. It feels disconnected from what’s come before, in a good way, which makes this outing feel fresh. Let’s back up a minute and talk about story and character. 'Guardians' opens up on Earth. The year is 1988. A young boy named Peter Quill sits in a hospital hallway listening to his Sony Walkman. The cassette tape label says "Awesome Mix Vol. 1" and features '70s rock tunes arranged by Quill’s cancer-ridden mother. When Quill’s Mom dies, the boy bolts out of the hospital where, impossibly, a spaceship appears and abducts him. Twenty-six years later, adult Quill (Chris Pratt) has become a space adventurer known (only to himself) as Star-Lord. Searching for a dangerous and powerful "orb" MacGuffin, Quill finds it on an abandoned planet and, after escaping from the villain’s henchmen, quickly becomes a wanted man. Quill’s boss, Yondu (Michael Rooker) sets a bounty on his head. Then, the villainous Ronan (Lee Pace) – a madman who wants to give the orb to an even bigger bad guy named Thanos so that Thanos will destroy Ronan’s mortal enemies, the Xandarians – sends Thanos’ daughter, Gamora (Zoe Saldana), to get the orb back. Anyway, the point is, by stealing this orb, Quill becomes a fugitive, sandwiched between Gamora and a pair of non-human bounty hunters. Rocket (Bradley Cooper) is a genetically engineered raccoon, who you could think of as a small, furry Hans Solo. In the Chewbacca role, we have Groot (Vin Diesel), a tree-like alien who can talk, but only the words "I am Groot" in slightly different tonal inflections to convey emotion. Unfortunately for everyone involved, local authorities arrest Quill, Gamora, Rocket and Groot, and ship them off to space prison. However, when Gamora reveals that she wasn’t going to return the orb to Ronan, but rather sell it for $4 billion space bucks ("units"), they form an unlikely alliance. With the help of another inmate, Dax the Destroyer (Dave Bautista) – a warrior who wants to kill Ronan and doesn’t understand sarcasm – they must overcome personal differences, escape the prison and, while running for their lives from the likes of Ronan and Yondu, decipher the truth behind the orb’s dangerous capabilities. By the exciting climax, billions of lives will be at stake, and the only ones who can save the day are a ragtag group of misfits: one assassin, one adventurer, two bounty hunters and a warrior. Ladies and space gentlemen, your Guardians of the Galaxy. Directed by James Gunn ('Super'), with a script co-written with Nicole Perlman, 'Guardians' is an absolute blast. As I said, the first act is a little convoluted, and we once again have a bunch of heroes obsessed with finding a magically dangerous and powerful oddly-shaped object, but those nitpicks aside, 'Guardians' has perfectly nailed tone and, by extension, character dynamics. It’s a wonderfully balanced mix of grand space adventure, sarcastic reference-based comedy, and grounded emotional arcs (albeit, sometimes these are rushed). The whole experience feels efficient and breathless. Pratt, who voiced the main character for 'The Lego Movie' earlier this year, proves himself to be a charming, charismatic leading man, while Saldana continues to bring star power to badass leading lady roles. Cooper and Diesel only appear in voice form, but they make for a hilarious Han/Chewie-esque team. However, while their CGI characters look quite good, Rocket’s raccoon fur isn’t quite as convincing as primates in 'Dawn of the Planet of the Apes'. Bautista gives a quiet, dry performance that earns lots of laughs too. Lee Pace chews an entire solar system worth of scenery as Ronan but, while it’s a grand performance, his villain is never truly scary. Lastly are plenty of other great cameos in the movie: Djimon Hounsou and John C. Riley are heavily featured in the trailers for a reason. The 'Guardians' world itself is gorgeously rendered, with a mix of computer graphics and many more practical sets than some audiences will be used to seeing in the modern green-screen era. I also loved the soundtrack. If someone pitched me the idea that, in addition to Tyler Bates' sweeping orchestral music, a space opera would be cut to 1970s rock songs, I would have passed. The rock n' roll works really well. Perhaps it’s a bit of nostalgia on my part (the film’s first scene in 1988 makes me roughly the same age as Peter Quill), but I don’t think so. These song choices aren’t just a wouldn’t-it-be-cool gimmick. They aren't like what Baz Luhrmann does either (approximate the feeling of an past era with modern influences). No, the film's soundtrack exists as a direct extension of Peter Quill’s haunted past. They, and a few of his leftover 1980s toys, are the only things he has left to remind him of Earth, to remind him of his mother. So when these various tracks work, not only do they set the specific scene's tone, they also reach back to Quill's childhood to hint at his broken heart. I don’t know about you, but this device impresses me to no end. It's simple, smart, and delivers on multiple levels. Hats off to James Gunn for either cracking that idea, or for saying yes to the person who pitched it. That said, I could see some viewers not digging the mix of genres and musical eras. I also wonder how younger audiences will react to the movie's references. Like many of the Marvel properties, this seems to be made a little more for adult audiences – for those who grew up watching Spielberg movies and reading comics. Without a direct knowledge of 1970s and 1980s pop culture, will the film work as well as it does for those who grew up in those decades? To be honest, I’m not quite sure. We’ll have to see what critics and audiences say, how the film plays over time, and how this part of the Marvel Cinematic Universe plays out. Regardless, 'Guardians of the Galaxy' is an unexpected blast and two full hours of escapist fun. It’s equal parts futuristic and nostalgic, with a great sense of tone, and an absolutely awesome cast of characters. I hope we see our galactic guardians again soon. 'Guardians of the Galaxy - 3D' debuts as part of a two-disc Blu-ray 3D + Blu-ray + Digital HD combo pack. Both the Blu-ray 3D and Blu-ray are encoded for Regions A, B, and C. The Digital HD copy must be used by December 2, 2019, and can be redeemed at iTunes, VUDU / Ultraviolet, and other streaming services. This film is also availabe on Blu-ray (single disc, 2D-only) and DVD. Marvel 3D post conversions have been a little hit or miss. However, much like the previously reviewed 4K Dolby 3D premiere, 'Guardians of the Galaxy - 3D' debuts on Blu-ray 3D with a reference quality MVC MPEG-4 encode with alternating aspect ratios designed to recreate the film's IMAX thearical presentation. Simply one of the best Blu-ray 3D titles released thus far, 'Guardians' aggressively uses z-axis depth to fill out the entire universe. From the very first, intimate shots of a little boy sitting in a long hospital hallway, all the way to an epic spaceship battle, the effect is nothing short of picture into another world highlighted by an often-florescent color palette. Even the dark scenes evoke appreciable z-axis depth, while equalling the 2D version in terms of color accuraccy and shadow detail. Black levels too remain strong. Further, as the owner of a 16:9 display, I really enjoyed the IMAX footage. There's no real resolution upgrade ('Guardians' was not, as far as I'm aware, shot with IMAX cameras), but filling in the 2.40:1 material's black letterboxing increases brightness and adds a sense of epic scale to establishing shots and action sequences. In truth, I would argue it's a shame Gunn and Marvel didn't follow James Cameron's 'Titanic - 3D' path of reframing the entire film for 16:9. But, don't worry, Constant Height fans, you can still crop the movie down to 2.40:1 if you prefer. For me, though, this alternating aspect ratio Blu-ray 3D is the best version of 'Guardians'. A little more immersive, a little more epic, even a little more engaging. Merry Christmas, readers, meet your new Blu-ray 3D demo disc. 'Guardians of the Galaxy' travels across the galaxy with a highly detailed, gorgeous AVC MPEG-4 encode framed in the film's original theatrical 2.40:1 aspect ratio. Much like its 3D (theatrical) presentation, 'Guardians' is a high definition Blu-ray stunner. This film boats a wide color palette, with lots of bright neon colors on everything from environments to starscapes to crazy alien skin tones. All of these are reproduced wonderfully. The film also mixes a number of brightly lit exterior sequences with tons of shadowy space and interior worlds, rendering a visually engaging word that is never monotonous. Black levels are spot on too, but never crush details. Special Effects too are highly detailed, with fully CGI characters Groot and Rocket coming to life in an almost photo realistic way. Finally, there are no signs of damage or encoding flaws. While not a show-stopper like its 3D counterpart above, 'Guardians of the Galaxy' on Blu-ray is definitely the perfect disc for 2014 to demo a new display (or test out an old one). 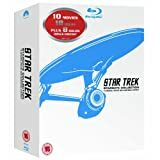 Despite debuting theatrically with an awesome Dolby Atmos mix, Marvel and Disney have elected to encode this Blu-ray in 7.1 DTS-HD MA. That being said, 'Guardians' sounds fantastic on Blu-ray, boasting an engaging, reference quality surround experience. Dialog is wonderfully clear, even in chaotic action sequences. Sound effects panning is aggressive, with laser blasts and space ships enveloping the home cinema environment. LFE is deep and punching, accentuating thrusters and thudding explosions. Finally, classic rock music fans are going to rejoice at how great and expansive all these tunes sound, wrapping out around the listeners. Unless you're an audiophile with a high resolution audio collection, you probably haven't heard these songs sound this good. Overall, 'Guardians of the Galaxy' is a fantastic Blu-ray audio experience. While a majority of the 'Guardians' bonus materials are HD Exclusives, the DVD includes one of the five Deleted Scenes listed below (not sure which one). Both the DVD and Blu-ray releases include an Exclusive Look at 'Marvel's Avengers: Age of Ultron', a short EPK-style behind-the-scenes look at the making of the next Avengers adventure. That film shot in New York, Italy, South Africa, and South Korea to give the story a more global / epic feel. Writer / director Joss Whedon talks about the new characters coming into the universe. Not much more here than what we already know, but that's okay. We should save all the good surprises for the finished movie. Fans will dig it. 'Guardians of the Galaxy - 3D' is an absolute blast of a movie that blends space opera action with 1970s-1980s Americana pop culture, making the whole thing feel fresh and proving, once again, Marvel is not yet done defining the Super Hero Genre. As a Blu-ray, 'Guardians' boasts a reference quality 3D presentation that's on the short list of best 3D post converstions ever, a high quality 2D presentation, a fantastic 7.1 surround experience, and a nice collection of bonus materials. If you love 3D or need a Digital HD copy, this edition for you represents a better value (3D and Digtal HD for a $5 premium) and an enhanced visual experience. If you loathe 3D or don't need a Digital HD copy, pick up the single-disc Blu-ray. Eitherway, this movie is Highly Recommended.